Ansell Hyflex 11-840 General Purpose gloves offer robust abrasion performance with enhanced comfort and high dexterity via a form fitting design that moulds to the hand increasing tactility and increased breathability. 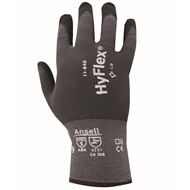 It’s a longer lasting glove with tear and puncture resistance with EN388 Cut Level 2 protection. 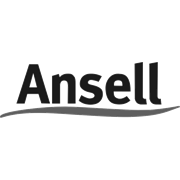 Ansell is proud to claim that Hyflex 11-840 is the best general purpose glove Ansell has ever produced, suitable for a range of applications such as handling/assembly of dry and light oily parts, general material handling nuts and bolts, general mechanic, warehousing, maintenance/utility, general purpose and packaging areas. The tough 1.1 mm FORTIX® nitrile foam coating (patent pending) offers EN Abrasion Level 4 protection, with up to three times the abrasion performance of other lightweight, knit-dipped gloves.